Projecting win-win situations, new economic opportunities, green growth and innovative partnerships, the green economy discourse has quickly gained centre stage in international environmental governance and policymaking. Its underlying message is attractive and optimistic: if the market can become the tool for tackling climate change and other major ecological crises, the fight against these crises can also be the royal road to solving the problems of the market. But how ‘green’ is the green economy? And how social or democratic can it be? This book examines how the emergence of this new discourse has fundamentally modified the terms of the environmental debate. Interpreting the rise of green economy discourse as an attempt to re-invent capitalism, it unravels the different dimensions of the green economy and its limits: from pricing carbon to emissions trading, from sustainable consumption to technological innovation. The book uses the innovative concept of post-politics to provide a critical perspective on the way green economy discourse represents nature and society (and their interaction) and forecloses the imagination of alternative socio-ecological possibilities. As a way of repoliticising the debate, the book advocates the construction of new political faultlines based on the demands for climate justice and democratic commons. This book will be of interest to students and scholars of environmental politics, political ecology, human geography, human ecology, political theory, philosophy and political economy. Includes a foreword written by Erik Swyngedouw (Professor of Geography, Manchester University). "This is an important and timely book. Kenis and Lievens present an incisive analysis of the productive plasticity of the contemporary environmental-political discourse that is epitomized by the concept of the ‘green economy’. Reading it, for me, felt like scratching an intense itch." "This beautifully written and engaging book was badly needed. Kenis and Lievens help us understand why the ‘green economy’ as currently rolled out will worsen rather than alleviate global social and environmental ills but also point to a realistic way forward. ‘The Limits of the Green Economy’ needs to be read widely and acted on as a matter of urgency." 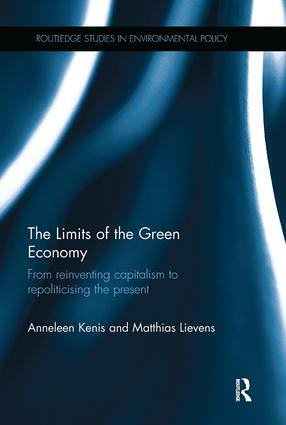 "In this timely book, Kenis and Lievens reveal the ‘green economy’—a vision of lush, eco-balanced affluence engineered through smart markets and ethical enterprise—to be a strategic mirage, a pied-piper panacea that co-opts even critical spirits into a politics of complicity with hegemonic power. Against the faux consensus they rehabilitate conflict; against quotidian capitalism they reach out to ‘the commons.’ Anyone with an interest in a habitable future on Earth should read this book." "With an intransigent analytical power and incisive surgical precision, this book reveals the limits of the green economy. The alternative political road Anneleen Kenis and Matthias Lievens aim to open up requires imaginative power, scientific insight in both natural and social processes (and their interaction), a rare intellectual courage, and especially an unwavering fidelity to the truth that things can and should be different." "This book not only provides us with the most authoritative critique of the ‘green economy’ written so far, but also invites us to think in original and novel ways about the environmental field." Anneleen Kenis is a post-doctoral researcher at the Divisions of Bio-economics and Geography at KU Leuven, Belgium. Her research interests include ecological citizenship, climate change, activism, air pollution, democracy, post-politics, feminism, and more broadly, political ecology. Matthias Lievens is a post-doctoral researcher at the Centre for Ethics, Social and Political Philosophy at KU Leuven, Belgium. His research interests include representation, ideology, democracy, the concept of the political, sovereignty and constituent power, and more broadly, continental political theory.